Change the Area or Choose a Sub District Birmingham City Centre" Westside" Inner City" Suburbs" Black Country"
Birmingham Museum and Art Gallery first opened in 1885. 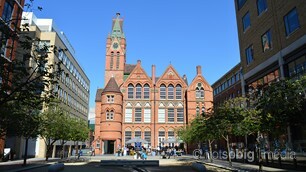 It is housed in a Grade II* listed city centre landmark building. There are over 40 galleries to explore that display art, applied art, social history, archaeology and ethnography. Carefully restored, an atmospheric 19th-century courtyard of working people's houses. Take a glimpse into the lives of the ordinary people who helped make Birmingham an extraordinary city. Admission to the Back to Backs is by guided tour only. The Sweet Shop is open to all. St Martin in the Bull Ring is one of the most ancient and contemporary buildings in Birmingham. Most of this Grade II listed church is from the nineteenth century. It was built in 1873 and is an example of gothic Victorian architecture, designed by Alfred Chatwin from Birmingham. 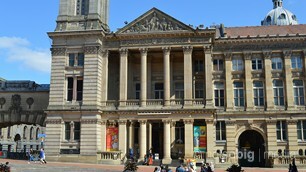 Victoria Square is home to both Birmingham's Council House and Town Hall. You can also see the old Main Post Office building. Just to the north is Chamberlain Square where you'll find the Birmingham Museum and Art Gallery. This area is at the centre of most events in the city. St Philip's has been a place of worship and prayer since at least the early 1700s. The cathedral is a living organism with services, choir practices and meetings taking place at times throughout most days but visitors are always welcome to come in and, if appropriate, take part. 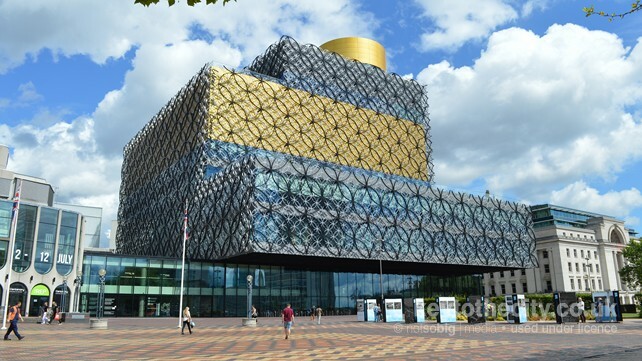 The Library of Birmingham is the city's public library located at Centenary Square. Designed by Dutch architects Mecanoo and opened in September 2013, it replaced the 1970s Central Library built in the brutalist style which many disliked immensely. The library is estimated to have cost over �188 million to build. 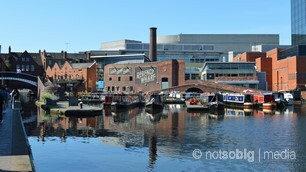 Gas Street Basin in Birmingham city centre is the heart of Britain's canal network. In days gone by it was the hub of a thriving canal transport network and would have been alive with the sound of cargoes as diverse as chocolate crumb, coal and glass being loaded and unloaded. Ikon is an internationally acclaimed contemporary art venue located in Brindleyplace. The gallery features temporary exhibitions over two floors and shows work by artists from around the world. A variety of media is represented including sound, film, mixed media, photography, painting, sculpture and installation. Named in celebration of the centenary of Birmingham's city status (1989), Centenary Square is one of the City's newest public open spaces. The square was originally planned to be the new Civic Centre for the city but was never finished. It is currently undergoing a complete reconstruction. St Thomas' Peace Garden is a small public park in Birmingham designated as a monument to peace and a memorial to all those killed in armed conflict. It was designed around the tower and west porticos of St Thomas' Church which was half demolished in the Birmingham Blitz in 1940 and never restored. BBC Birmingham is located in The Mailbox leisure complex. Within the Public Space area you can try your hand at presenting the news or a weather bulletin and take a touch screen tour of the radio drama studio where The Archers is recorded. When the proprietors of the Smith and Pepper jewellery manufacturing firm decided to retire in 1981 they ceased trading and locked the door, unaware they would be leaving a time capsule for future generations. 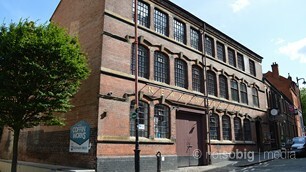 Today the factory is a remarkable museum, which tells the story of the Jewellery Quarter. Established in 1881, J. W. Evans is one of the most complete surviving historic factories in Birmingham's Jewellery Quarter. To walk into the factory today is to enter a lost industrial world. Behind the frontage of four terraced houses, the workshops retain their original drop stamps and fly presses. 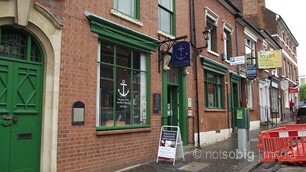 St Paul's is a Grade I listed church in the Jewellery Quarter, a busy area dedicated to jewellery making and other arts and industries. The church is set in Birmingham's last remaining Georgian square and an example of late 18th century urban planning in Birmingham, with rolling lawns and tree-lined walks. Eastside City Park is the first major, new city centre park in Birmingham for more than 130 years. The park has greatly increased the amount of green space within the City Centre, providing a visitor attraction alongside the Thinktank Birmingham Science Museum. The museum opened in 2001 and contains an amazing collection of around 5,000 objects related to the Birmingham steel pen trades and the history of writing. The collections including items of factory machinery plus other hands-on objects are situated over three ground floor gallery spaces. The Royal Birmingham Society of Artists (RBSA) is an artist-led charity which supports artists and promotes engagement with the visual arts through a range of inclusive activities - exhibitions, workshops and demonstrations. Before the 1880s almost all the guns made in Britain were made in Birmingham. Until 1813, however, all had to go to London to be tested. In that year the Birmingham Proof House, designed by John Horton, opened. The museum is only open to visitors by prior appointment. Cannon Hill Park was designed by Mr T J Gibson, who also designed Battersea Park in London. It was opened to visitors in 1873 and is made up of 80 acres of formal parkland and 120 acres of conservation and woodland plantation. A Grade II listed Bandstand forms part of the original park layout, set in a natural amphitheatre. 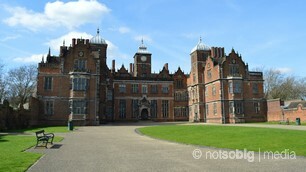 Aston Hall is one of Birmingham's most treasured buildings. Redisplayed as part of the development project, Aston Hall boasts sumptuous interiors from the 17th, 18th and 19th centuries, including the magnificent Long Gallery. Charges apply to house only. Gardens, grounds and visitor facilities are free to visit. This timber-framed house was built in 1590 by Richard Smalbroke, a member of one of Birmingham�s leading merchant families. More than 400 years later, beautiful Blakesley is still a haven; secluded from the avenues of modern houses that lie beyond its gates. Cadbury World opened in 1990 and allows visitors a glimpse into this famous chocolate factory as well as learning about the manufacturing process and the history of the company. Cadbury was taken over by Kraft Foods in 2010, despite widespread disapproval from the British public. Sutton Park is an historic landscape that covers an area of over 2,000 acres and attracts over two million visits every year. There are opportunities to enjoy walking, jogging, angling, nature watching, orienteering, play areas, restaurants and use bridle paths and cycling routes in the Park. Selly Manor dates back to the 1300s. 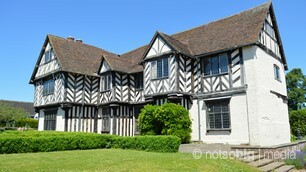 Court rolls of 1327 first mention it as Bournbrook�s manor house, home to local tax collectors the Jouette family. In 1907, busy establishing his vision of a Bournville village, local chocolate maker and philanthropist, George Cadbury, saved it from demolition, securing its future. In Kings Norton you'll find the largest complex of medieval buildings in Birmingham. The Tudor Merchant�s House and the 17th century Old Grammar School are set either side of St Nicolas' Church, a place of worship much of which has stood here since Norman times. The Birmingham Botanical Gardens is a 15 acre botanical gardens situated in Edgbaston. Dating from the 1830s, there are four glasshouses including the Palm House and Lily House. There is a large lawn in front of the glasshouses with a range of beds and shrubberies. Sarehole Mill is one of only two surviving working watermills in Birmingham. The existing building was constructed around 1750, although there was known to be a mill here as early as the Tudor period. Charges apply to the Mill only. Grounds and tearoom are free to visit. Birmingham Wildlife Conservation Park homes a wide range of animals including Asian Short-Clawed Otters, Porcupines, European Lynx, Squirrel Monkeys and Emperor Tamarins. The Lapworth Museum of Geology dates back to 1880, and is one of the oldest specialist geological museums in the UK. Throughout its long history the Lapworth Museum has provided a valuable resource for students, enthusiasts and anyone with an interest in geology. Featuring many of the greatest names in Western art, The Barber holds one of the most outstanding and internationally significant collections assembled in Britain during the 20th Century. Founded in 1932, the collection is housed in a Grade II listed Art Deco building. Restored to its Edwardian Arts and Craft splendour, Winterbourne House is a unique heritage attraction � set within seven acres of beautiful botanic gardens. 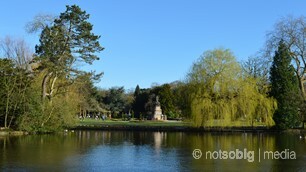 Only minutes from Birmingham city centre, Winterbourne is a hidden gem � home to beautiful antiques and over 6,000 plant species from around the world. The museum is home to over 90 buses. Midland Red, WMPTE blue and cream and the corporation fleets from Birmingham, Walsall, West Bromwich and Wolverhampton are all represented. There is also an extensive collection of battery electric vehicles plus a miniature steam railway which operates on event days. 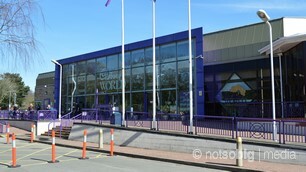 The National Motorcycle Museum is recognised as the finest and largest motorcycle museum in the world. It is a place where �Legends Live On� and it is a tribute to and a living record of this once great British industry that dominated world markets for some sixty years. Formerly the Birmingham Railway Museum, Vintage Trains is a charitable trust and custodian of the Tyseley Collection of railway engines. Although museum activities have now ceased, they hold Open Days at the Tyseley Locomotive Works and offer mainline steam excursions including their Shakespeare Express. Moseley Road Baths, in the Balsall Heath district of south Birmingham, is a building of national importance. 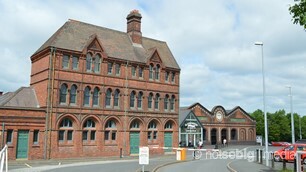 Opened in 1907, it is the oldest of only three Grade II* Listed swimming baths currently operating in Britain. Only the smaller pool is currently operational. Opened in July 2000, Star City is situated north east of the city centre towards the M6 motorway. It features many leisure attractions and a varied choice of dining and drinking venues all under one roof. The ruins at Weoley Castle are over 700 years old and are the remains of the moated medieval manor house that once stood here. The site has been inhabited from the 12th century and, according to the Domesday Book, was part of the estates of William Fitz Ansculf. Covering 26 acres of former industrial land, the Black Country Living Museum is an open-air museum offering a glimpse into 200 years of the area's history. Opened in 1980, the museum has since greatly grown, adding new buildings and exhibits to the large site. The Dudley Canal Trust helps you explore this historic part of the 'Black Country'. Experience over 420 million years of history in a 45 minute tour. Marvel at the impressive limestone caverns carved by man to gain access to the raw materials that changed our world forever. Dudley Zoological Gardens is unique - a zoo with hundreds of animals set around an 11th century castle incorporating the world�s largest single collection of Tecton buildings and the country's only vintage chairlift. All sited on a 40 acre wooded hillside with a rich geological history. Oak House in West Bromwich is a delightful half timbered yeoman farmer's house built round about 1630 or earlier. The house boasts some fine panelling and is furnished with 17th century furniture.